Shelf Inflicted: Boy's Life. Beatiful and sleepy. Boy's Life. Beatiful and sleepy. Recommended for: For the right mood. Think Something Wicked This Way Comes without a focused antagonistic plot line. Think Alice Hoffman. Think of something leisurely, and winding, with just a trace of the unreal. Think of boyhood stories from your southern grandpa, told by a master. 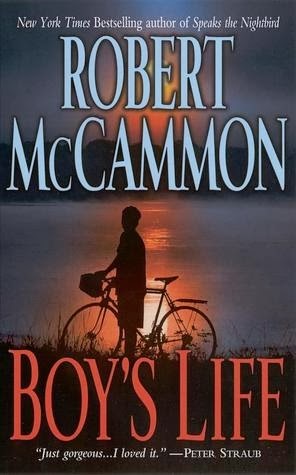 Boy’s Life is very evocative, an atmospheric picture of Cory Mackenson, a young man growing up in a small Alabama town during the 1960s. One early morning, he’s with his father making milk deliveries when they witness a car speeding into a lake of endless depth. His father attempts to rescue the driver only to discover he is already dead, savagely beaten and strangled. It becomes a transformative moment for his father, and perhaps for Cory as well. The chapters that follow often refer to it, but not in any plot-moving way. There is a sleep-over at a friend’s house. There is the death of the boy’s bike and a junkman. A church service with wasps. A town flood. An elderly black woman. A bike. The last day of school. A new boy moving into town. A cross burning on a lawn. His first typewriter. An overnight in the woods. All the sort of things that one might look back on one’s life and say, “I remember when,” when thinking of those moments that encapsulate a feeling, a change, a pivotal experience. Intertwined through them is a strain of magic, but not ‘magic’ in the sense that we usually use the word in modern literature, but life magic from the perspective of an imaginative child. While the storytelling was masterful, there is no clear sense of plot beyond ‘day-in-the-life’ and self-discovery, leaving the conflict-focused reader searching for a connection between chapters. Since both the book blurb and the first chapter hint that the lake experience was the harbinger of something strange, it is an understandable confusion. There are dribbles and moments that contribute to the puzzle of the dead man, as well as the reverberating effect on the father, but truly, serious plot development and resolution is left until the last 80 pages of an over 500-page book. The murder bookends this section of the boy’s life, but does not drive his experiences. I think if one heads into it expecting more of a Faulkner-esque short story collection, the read is more likely to be successful and satisfying. The writing is lovely. The characters are well developed, and McCammon even manages to imply the real at the same time the narrator is interpreting the fantastic. I also appreciate the contextualizing and gentle exploration of racism during a transformative time in the south. He also nicely captures the feeling of impending adulthood shadowing the edges of the tales, as well as those inklings when one starts to realize adults are people with their own foibles and may even have been young once. Ultimately, be prepared to go slow. I often read it before bed, as it was usually soothing, not action driven, and each chapter encapsulated. Normally, I wouldn’t give a book I fell asleep on four stars, but the characterization as well as overall writing really are impressive. Highly recommended–for the right mood.